A blessing how and that the Lord broke into me! I've shared this every year, one way or the other. So, will share it again. It sure hits my heart strongly every April 15th. I rejoice for the Lord and thank Him overwhelmingly. Because He truly is the joyfulness of my heart, soul, and spirit. To share it, as I often say, it ain't short, but is truthful. Bless you on my most blessed day. My salvation changed my world, obviously, and the world of many others connected to me through my God-seed-planting since then. I was 19 and at my friend Susan's house. I was living in Tacoma, WA. Towards mid-March a young woman at work, Carol, 18, was suddenly without a place to live and couldn't afford to fly back to her family in the St. Louis area. Donna hollered at work, "Hey, Joanne, you have place in your apartment. Let her move in with you." I didn't know Carol very well, but knew she was a sweet person -- and I WAS NOT!!! I knew it was the right thing to do, so agreed that she could, but I also said to her: You can move in with me. BUT I go out when I want to go out, I come back when I want to come back, and if you don't like it, you can leave. Amazingly, even hearing that "jerky" statement, Carol moved in. What I didn't know was that she was a Born-Again Christian. I didn't know what that was, anyhow, so it wouldn't have sunk in. Over the next couple of weeks we yammered about religion for hours nearly every night. 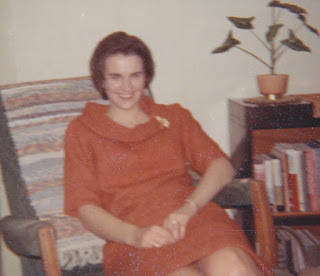 She couldn't always come up with answers for me, so she connected me to Stan, a man in her church, and he would hammer topics out with me on the phone. Very straight-forward, which is what works best with me most of the time. I decided to go to church with her -- Portland Avenue Baptist Church. My second Sunday, on April 10th, it was Easter. At the end of the service, there was an altar call and I knew I was supposed to go forward. I could feel the pressure in my heart ... my whole body ... in a way I had never experienced before... but I held on tight to the back of the pew in front of me so I would be able to not step forward and give in. I left church feeling pleased that "I won the battle." The next Thursday, at work, Carol banged her head at a desk in our office and ended up in the hospital. She would there until Saturday. I was invited to dinner at Stan's house on Friday, and enjoyed dinner with him and his wife and four sons. After we finished eating, and Anita had cleared the table, and the boys had disappeared to the living room, Stan had me stay in the kitchen with him and he laid the facts of Christ's sacrifice out for me very clearly. Stan knew how sinful I was ... he had a similar history ... and he didn't look down his nose at me at all. He knew God could turn my awful life around, no question. I told him that I believed what he was telling me about Jesus and His sacrifice and the possibility of salvation, but I said I needed to straighten up first or I couldn't come to Him. Stan, of course, said it was the other way around -- come to Christ and the changes would start to take place. I knew he was right, and I made the commitment and invited Christ into my life. In my mind, because of all the abuse I had experienced from many others, mostly men, this was simply a "contract"... no emotional attachment to the Father or Son, just an agreement to follow the rules He laid down and, if I messed up, take the punishment that would hit me. After my prayer, Stan and I went to a young adult Bible study, so only an hour after I was saved I made the public statement and they rejoiced. I remember that the next morning when I woke up my first thoughts were about the new life I had before me. And it was then, and has always been. Even though I was far from perfect, the Lord kept moving me along; He didn't give up on me. Stan wrote an article for a Baptist teachers magazine a year later and described someone who walked with the Lord, fell on her face in the mud, and climbed back to her feet again, and went forward and... fell on her face in the mud. How often this took place. He also said it was the climbing out of the mud and back onto her feet that made the difference. And that he trusted that as she grew in the Lord the pattern would simply be the walking. 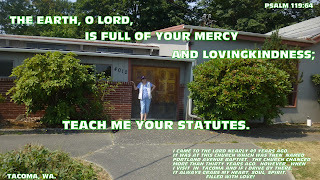 AND he smiled and laughed to tell me it was about me when I had come to the Lord and was adjusting my life. He winked at me. Well, even after all these years, most of the time I can say that is true. Occasionally, I do end up with a little mud on my face, but it wipes off thoroughly ... by the blood of Jesus. Where would I be if this all had not come to pass 50 years ago? Most certainly no one would know me today. I would have been continuing to be involved with much of the sinfulness, and would have died from violence, alcoholism, or suicide. No friends, no family, and, most certainly, no hope for my future. The key word every time I have during my Re-birthday is: HALLELUJAH!! 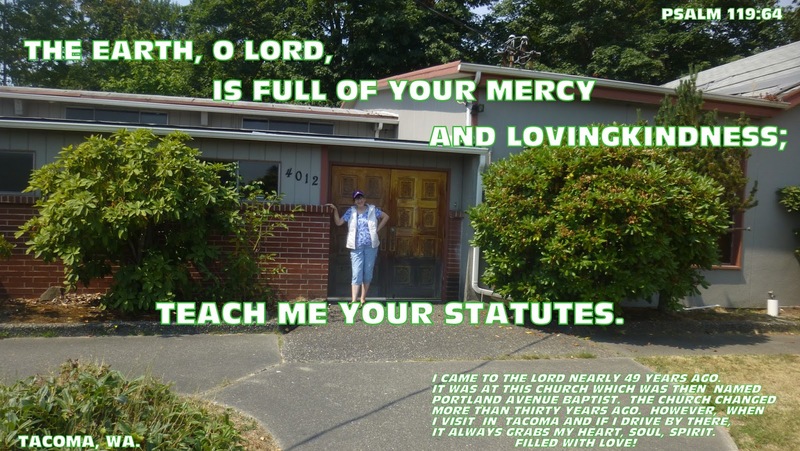 In August, 2014, when in Tacoma with a friend, and showing her the church I had been at when coming to the Lord, she wanted to take a picture of me at it. It has had many different church groups and much of it has needed to be rebuilt. But 50 years ago, it was my special place. They truly put up with me and I was there for about 4 years until I was in California, and even visited there for several more years if visiting Tacoma. The church members also were wonderful for my sisters who are younger than I am and they were cared for and loved. Anyhow can't not show the photo again. It's a blessing to have it with me when the picture was taken.